It’s the last Thursday in October, which means it’s time for your free November 2017 desktop wallpapers! This month, I decided to jump on the iPad to create a fall themed illustration/doodle explosion wallpaper 🙂 November is hand lettered with my own custom Procreate brush (all illustrations were created with that same texture brush) and the dates are set in my newest font, Skinny Jeans (caps style). The final illustration was exported out of Procreate as a psd, where it was slightly edited (subtle watercolor background texture added) and then combined and resized with the dates. The download includes the November 2017 desktop wallpapers in two common resolutions: 1280x1024px and 1920x1080px, with and without dates. I’ve left the year off of the ‘no-dates’ versions, so you can use it for any November in the future, too! My newest font, Skinny Jeans, just went live this week! I’ve been making a point to share process info for the fonts I make (here’s Espresso Roast), so that’s what this week is all about 🙂 Skinny Jeans is a font trio that includes the main script style, a caps style that pairs perfectly and a symbols font to add extra personality to layouts. The hand drawn + illustrated symbols also come as a vector file to make things quicker for those who work in Illustrator. This font is by far the most in depth of all I’ve created; it contains 30+ ligatures, alternates and extra features. 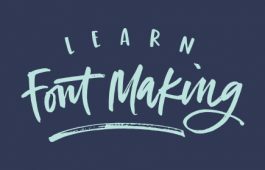 In the video below, you’ll see what raw materials I used to initially hand letter the font, then the steps I took to make it a fully functioning font. Read on to see everything!